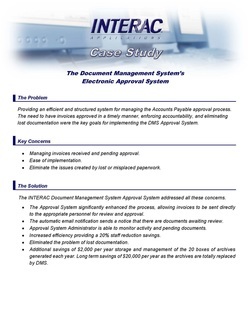 INTERAC Document Management Approval System - Intersoft Systems, Inc.
Providing an efficient and structured system for managing the Accounts Payable approval process. The need to have invoices approved in a timely manner, enforcing accountability, and eliminating lost documentation were the key goals for implementing the DMS Approval System. Managing invoices received and pending approval. Eliminate the issues created by lost or misplaced paperwork. The INTERAC Document Management System Approval System addressed all these concerns. The Approval System significantly enhanced the process, allowing invoices to be sent directly to the appropriate personnel for review and approval. The automatic email notification sends a notice that there are documents awaiting review. Approval System Administrator is able to monitor activity and pending documents. Increased efficiency providing a 20% staff reduction savings. Eliminated the problem of lost documentation. Additional savings of $2,000 per year storage and management of the 20 boxes of archives generated each year. Long term savings of $20,000 per year as the archives are totally replaced by DMS. EDiS is a privately held business with family and nonfamily management, providing comprehensive construction project solutions from the pre-design phase of a project through construction and facility occupancy. The company was established in 1908 offering customers a continuum of services from site selection to design and budget analysis, through construction and facility occupancy. EDiS serves the Delaware, Maryland, Pennsylvania and New Jersey area. The staff includes over 80 employees, including project managers, field managers, registered architects, engineers, land planners, estimators, financial managers and administrative staff. The Document Management System was implemented in the fall of 2008 and is being used extensively to store and retrieve all kinds of documentation. The accounting team uses DMS to store all the AP, AR, Payroll documents that come through. Documents are attached either to the appropriate detail transaction, or to the master file record. The former binders of process documents have been replaced with DMS files. Paperwork is now being shredded as soon as the data has been audited. A primary goal of DMS was to enhance the accounts payable process. One of the main challenges was getting incoming vendor invoices approved for payment in a timely fashion. Frequently the project managers were not in the office or readily available to review and approve their invoices. Paperwork was often misplaced as it was routed from desk to desk. Keeping track of all this flow of paper was very inefficient. DMS remedied these issues. The Approval System has been a very effective tool in streamlining this entire process. Incoming documentation is now scanned immediately, coded with the appropriate vendor information and routed directly to the appropriate project manager for review and approval. Using the automatic DMS email notification, each project manager receives an email reminder that documents are pending. Now the AP clerk is able to monitor all the pending documents and hold the appropriate people accountable. As the invoices are approved and released, they flow directly into the AP process for payment. Project managers are now able to log into their Approval System in-box remotely, allowing them to review and release documents 24/7. They no longer need to return to the office to access and review their paperwork. DMS has been a great productivity enhancement, allowing the accounting staff to be much more efficient. They are now processing the same volume of work with 20% fewer people. Implementing DMS and the approval system was very easy as well, taking only two months for the staff to be comfortable and fully operational. In addition to the savings in personnel costs, DMS is also saving about $2,000 per year in storage costs for the 20 boxes per year of archives that are no longer being generated. As the remaining archives are replaced by DMS, the net savings will grow to $20,000. Saves significant time and money.